Abstract: Management of severe traumatic injuries and complex dental anomalies in children requires a holistic approach with planning for both short- and long-term eventualities. The goal is to provide biological treatment that maximizes the long-term dental health, appearance and function. Tooth autotransplantation is one potential solution for tooth replacement that is able to fulfil these aims. 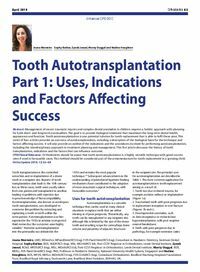 This series of four articles provides an overview of autotransplantation, including a description of the biological basis for the technique and factors affecting success. It will also provide an outline of the indications and the procedures involved for performing autotransplantation, including the interdisciplinary approach to treatment planning and management. This first article discusses the history of tooth transplantation, indications and the factors that can influence outcome. Clinical relevance: Orthodontists should be aware that tooth autotransplantation is a highly versatile technique with good success rates if used in favourable cases. This method should be considered part of the armamentarium for tooth replacement in a growing child. Author notes: Joana Monteiro, LMD, MDentSci, MPaedDent(RCS Eng), FDS Paed Dent(RCS Eng), Consultant in Paediatric Dentistry, Eastman Dental Hospital, Sophy Barber, BDS, MJDF(RCS Eng), MSc, MOrth(RCS Ed), Post-CCST Registrar in Orthodontics, Leeds Dental Institute, Zynab Jawad, BChD, MFDS(RCS Eng), MSc, MOrth(RCS Ed), Post-CCST Registrar in Orthodontics, Leeds Dental Institute, Monty Duggal, BDS, MDSc, FDS Paed Dent(RCS Eng), PhD, Professor in Paediatric Dentistry, National University Health System, Singapore and Nadine Houghton, BDS, MFDS, MDSci, MOrth(RCS Eng), FDS Orth(RCS Eng), Consultant Orthodontist, Bradford Teaching Hospitals Foundation Trust, Bradford Royal Infirmary, Duckworth Lane, Bradford, West Yorkshire, BD9 6RJ, UK. Objective: To outline the application of autotransplantation for replacing teeth in growing children, highlight the advantages and disadvantages of autotransplantation and identify the key components of healing following autotransplantation and prognostic factors for success.